At New York Comic Con, High Moon Studios revealed another Marvel character appearing in their Deadpool game. The Merc With A Mouth will be joined by X-Force member Domino. 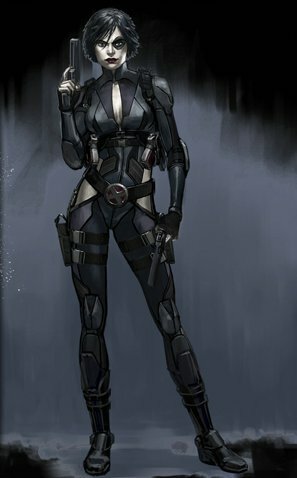 Domino is a mutant with an unusual ability: luck. She has a subconscious ability to turn the odds in a situation to her favor. In a gun battle, she can make an enemy's gun jam or enable herself to make a one-in-a-million circus shot. Her skillset is very similar to Deadpool's. She's adept with firearms as well as hand-to-hand combat. Also, like Deadpool, she often works as a mercenary so there are plenty of opportunities for these two to cross paths. High Moon previously revealed that Wolverine and Psylocke will be in Deadpool as well. I suspect they'll announce additional cameos as we approach the game's 2013 release.